Easy Meatball appetizer recipe made with an incredible 3 ingredient sauce that everyone raves about! Combine frozen meatballs & Lil Smokies in this simple & delicious appetizer recipe perfect for parties. Easy Meatball appetizer recipe that’s simple & delicious appetizer recipes perfect for parties. Use frozen meatballs and store-bought Lil smokies for a tasty snack that everyone loves! This meatball appetizer recipe is probably one of the simplest appetizers out there and it’s such a crowd pleaser. I’ve tasted many versions, but my meatball sauce recipe is THE BEST! It’s got a great smoky, sweet flavor, unlike other meatball appetizer sauces that end up just tasting like bbq sauce. This delicious meatball and Lil Smokies appetizer is so easy to make! All you need is some Lil Smokies and meatballs (I just use store-bought frozen meatballs, but you’re welcome to make your own), barbecue sauce, chili sauce, and grape jelly. I use the Kraft Thick and Spicy Brown Sugar BBQ Sauce, but again, you’re welcome to use whatever type of barbecue sauce you’d like. Grab your sauces and add them all in a saucepan and whisk it until well combined. Turn the heat up to medium and put the lid on the pan. Let it warm up for about 5 to 8 minutes and then whisk it again until the sauce is smooth and hot. Add the meatballs and Lil Smokies into the saucepan, turn the heat down to a medium-low. Put the lid back on the pan and let it cook for 30 minutes. It’s so nice to take a break and just let the amazing smell fill your kitchen! This meatball appetizer recipe can easily be made in the crockpot! Just throw everything in, put the lid on and let this tasty treat cook on low for just 2-3 hours. We make this meatball appetizers with a simple 3 ingredient sauce that tastes amazing! Yes, it calls for grape jelly. I know, I know, you likely haven’t eaten grape jelly since you were about 5, but trust me on this one! The grape jelly adds a sweet tanginess that when combined with the bbq sauce and chili sauce, it is out of this world delicious. Try it! Combine sauces and jelly in a saucepan and whisk to combine. Turn heat on medium and put the lid on the pot. After about 5-8 minutes, once the sauce has heated up a bit, whisk again until smooth. Add meatballs and Lil Smokies. Turn heat down to medium-low, replace lid and cook for about 30 minutes. Serve in the crock pot on warm, or transfer to a ceramic or porcelain bowl.Place appetizer forks or toothpicks nearby for easy snacking! This is probably one of the simplest appetizers out there and it's such a crowd pleaser. I've tasted many versions, but I really like that this sauce doesn't just taste like bbq sauce! It's different- it's got a nice sweet, smoky favor that is just so good. I serve these game day meatballs and smokies in a ceramic or porcelain bowl. 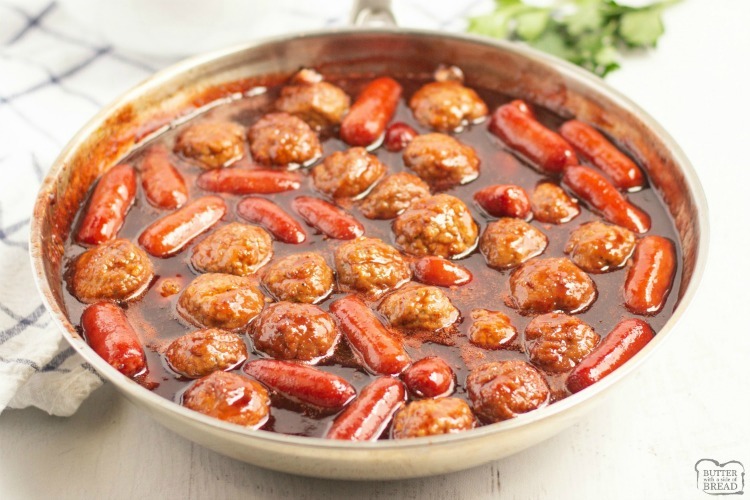 Ceramic and porcelain retain heat well, so if you serve the meatballs and smokies hot, they’ll stay warm for around 30 minutes, which is usually more than enough time since they tend to get eaten quickly! And of course if you cook them in the crockpot you can turn it on low or warm and serve it from in the crockpot. What is the best brand of frozen meatballs? Are Chili sauce and cocktail sauce the same thing? I only ask because you have cocktail sauce listed in the ingredients, but then show a picture of chili sauce. So I&#39;m confused . . . It looks delish though! oops! LOL- I apologize- you use CHILI sauce, not cocktail sauce! They are not the same thing! I fixed it! THANK YOU!! Trying this recipe for the first time tonight ! I make this exact recipe except mine calls for jellied cranberry sauce instead of grape jelly. It adds a bit of tartness. can you add frozen meatballs to the crockpot with the smokies?? I have always made these meatballs with only chili sauce and the grape jelly. I have seen where a different jelly was used. I have some spicy habinaro strawberry jelly and was wondering if that would be good instead of the grape! is this a spicy recipe? Nope, it’s not spicy at all. My go to recipe is similar. I use blackberry jam & a couple of spoons of yellow mustard. Today I’m trying this recipe. Ummm, yummy! Merry Christmas everyone! Adding mustard sounds SO GOOD- I’m going to try that! Thank you… and glad you liked it! Can I use just the bbq and chili sauce for this? You can, but trust me, the flavor with all 3 ingredients is exceptional! What amount of time if cooking in an Instant Pot? Not very clear what is meant by chili sauce. I made it with Huey Fong Chili Garlic Sauce and Sriracha chili sauce. Can’t say I was very pleased with that. I came back here and just now see your photo–looks like it’s a taco sauce.